“His readings of the Quran affected his ability to discern right from wrong”? How Islamophobic of his defense team! He believed, and still believes, that he was doing something good and even noble. On Sept. 24, 2014, ISIS inspired Islamic convert Alton Nolen entered a food processing plant in Moore, Oklahoma. He took out a butcher knife and beheaded Colleen Hufford and critically stabbed Tracy Johnson. Both were employees at the factory. 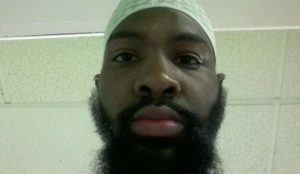 Nolen, who had been recently suspended from the plant, was a practicing Muslim who was obsessed with gruesome Islamic State beheading videos going viral at the time. Nolen was shot and apprehended after his rampage. Nolen was facing either the death penalty or life in prison without parole after a jury trial in Oklahoma. Friday, the judge handed down his sentence: Death. Judge Lori Walkley took a jury recommendation for the death penalty after months of deliberation. Nolen’s defense argued that he was mentally ill and that his readings of the Quran affected his ability to discern right from wrong. However, recordings of Nolen taken from the hospital and played for the jury showed no remorse over the brutal attack….